Forwardmoving is designed to encourage creative and inspiring scripture study. Move around and be blessed! Digging in the Scripture for jewels and sharing them in creative ways. ​Praying in the Word - Melody Mason with downloadable cards. 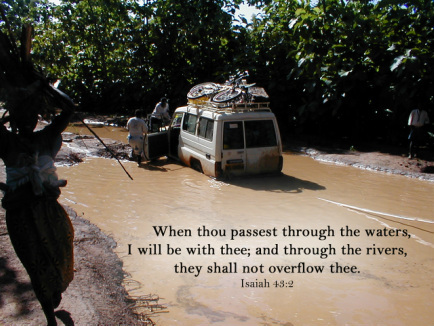 THE PHOTOS: Going Forward: During our work in Sudan, from 2001 to 2007, we traveled the Kaya, Yei, Maridi road between the church offices in Uganda and the Sudanese churches in southern Sudan often. The photo at the top of the page was taken 2002 at the notorious 14 mile post on the road from Kaya to Yei. My husband was driving. We were not stuck! Above left depicts a typical challenge to our travel--huge puddles (small ponds). Above right: I discovered this little "ant" hut along on the road to Maridi. Large fields of these perfect little huts made one wonder just who invented the hut design first.